The implementation of new regulations affecting marine fuel specifications will have implications for crude oil and petroleum product markets over the coming decade. Previous Today in Energy articles described these regulations and the short-term implications for refining margins through 2020. Today’s article discusses the longer-term implications of the market changes projected in EIA’s recently released Annual Energy Outlook 2019, as the response to these regulations will likely involve changes to ships, marine fuels, refining, and some infrastructure in the next six to eight years. The International Marine Organization’s (IMO) new regulations limit the sulfur content in marine fuels used by ocean-going vessels in international waters to 0.5% by weight starting in January 2020, a reduction from the previous global limit of 3.5% established in 2012. This lower limit will change the way bunker fuel (the fuel mix consumed by large ocean-going vessels) is consumed in the United States, which, according to AEO2019, accounted for about 411,000 barrels per day (b/d) in 2018. This volume represents 3% of total transportation energy use and 1% of total U.S. petroleum and liquid fuel use. Residual oil currently accounts for the largest component of bunker fuel. 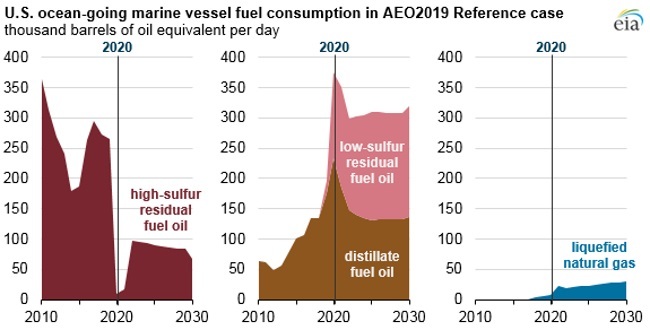 EIA projects that the share of high-sulfur residual fuel oil consumed by U.S. ocean-going marine vessels will quickly drop in the near term, from 58% in 2019 to 3% in 2020 because few ships currently have scrubbers installed or will have them installed by 2020. As some ships install scrubbers that allow them to consume higher-sulfur fuels, EIA expects the residual fuel share to rebound partially to 24% in 2022. Switching to lower-sulfur residual fuel oil or higher distillate blends is likely to be a more common compliance option for U.S. vessels. EIA projects that the share of low-sulfur residual fuel oil consumed in the U.S. bunker fuel market will increase from close to zero in 2018 to 38% in 2020. Similarly, EIA projects that the need to use distillate in lower-sulfur bunker fuels will increase distillate’s share of U.S. bunkering demand from 36% in 2019 to 57% in 2020. After 2020, these fuels continue to account for relatively large shares of the fuels used in marine vessels. EIA expects the use of liquefied natural gas (LNG) in U.S. marine bunkering to be limited in the next five years, reflecting the limited infrastructure available to accommodate LNG bunkering at U.S. ports. As infrastructure adapts, LNG’s share of U.S. bunkering grows to 7% in 2030 and to 10% in 2050. Similar to the January Short-Term Energy Outlook (STEO) forecast, the AEO2019 Reference case projects that the U.S. refining sector will respond to the projected lower demand for high-sulfur residual fuel oils as well as increased demand for low-sulfur fuels in two ways: increasing refinery utilization and switching to lower-cost inputs. Much of U.S. refining capacity, especially on the U.S. Gulf Coast, has downstream units that upgrade residual oils into more valuable and lower-sulfur products. These complex units can process heavier and higher-sulfur crude oils that yield large quantities of residual oils. 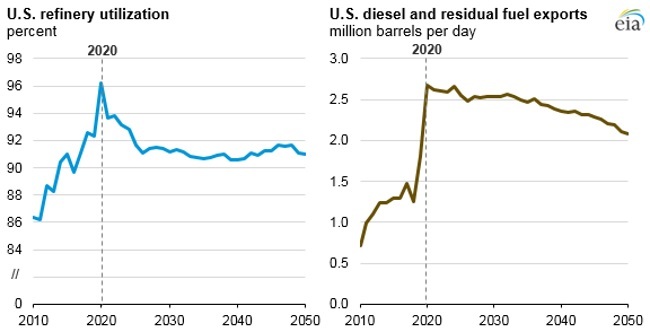 U.S. refinery utilization increases to 96% in 2020 and remains between 90% and 92% after 2026 through 2050 in the AEO2019 Reference case as these refineries aim to convert heavy, high-sulfur crude oil and residual fuel oil into lower-sulfur fuels. This change results in both increased imports of unfinished oils and increased exports of lower-sulfur diesel and residual fuels to supply the global market.